Ellie Krieger for The Washington Post shared that some traditional foods are essential to our personal holiday experiences, connecting us to loved ones past and present and fulfilling us in ways beyond what any nutritional analysis could measure. But most of the edibles at holiday parties don’t have nearly that status, and there is more than one option that will hit the spot no matter the craving. In those cases, choosing smartly means you get to enjoy bigger portions that are better for you. These party swaps illustrate just how much more bang for your calorie buck you can get, without sacrificing a drop of holiday spirit. 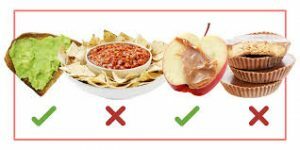 Both bring a salty crunch by the handful, but you can have more than twice as many pistachios as potato chips for the same calories, and the nuts also have a wealth of nutrients. Plus, getting them shell-on means built-in portion control, because cracking them slows you down and the shells pile up, so you can track how many you have eaten. These should be savored and enjoyed for what they are. Personally, two butter cookies made from my grandmother’s recipe would give me more satisfaction than 10 of any other treat. For the same calories, you get more than four times as many shrimp, and that volume alone will leave you feeling more satisfied. Plus, the shrimp provide more protein and essential minerals, without any of the unhealthy fat or nitrates. Besides the huge portion difference per calorie, tomato-based salsas are rich in antioxidants and vitamin C, which might help you fight off the colds that tend to get passed around at parties this time of year. Taking advantage of the cut vegetable platter means exponentially more crunchy dipping power than you get with chips. Health-wise, the more vegetables the better, so dipping them in salsa is a doubly smart move. I’m not saying you should drink four glasses of champagne; I’m saying you could for the same number of calories as a mug of spiked eggnog. But even one or two flutes of those tiny bubbles makes a gathering feel like a real celebration. Popcorn is not just a fun party food but also a whole grain, and it is voluminous, so the portion size is bountiful. The equivalent in pretzels is skimpy by comparison. The nutrient you didn’t know you were missing Happy New Years!